BEIJING, China – Beijing police have announced plans to crack down on bicycle theft by establishing a database of thieves. Wang Xiaobing, an officer with Beijing Municipal Bureau of Public Security, said bike theft was rampant in the city and the database was needed. “Citizens who buy stolen bicycles for the first time will receive criticism and education,” he said. However, if they do it a second time, their action will be regarded as “buying stolen goods” and they will receive public security penalties including a warning, detention or even re-education through labour. "Citizens who buy stolen bicycles for the first time will receive criticism and education," he said. However, if they do it a second time, their action will be regarded as "buying stolen goods" and they will receive public security penalties including a warning, detention or even re-education through labour. Personal information such as names and photos will be recorded in the database. People who purchase large numbers of stolen bicycles will be jailed for committing the crime of Buying Stolen Goods, according to the Criminal Law. 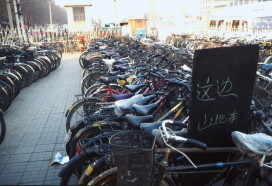 Wang said the police launched a tough crackdown on bicycle theft at the beginning of the year. So far, 1,702 suspects have been seized or detained for stealing or selling stolen bicycles, and 1,355 stolen bikes have been confiscated. Wang reminded citizens to observe the law and not buy stolen bikes. Chen Xinliang, a law professor with Peking University, said it is illegal to purchase stolen goods. "People will be punished according to the Law on Public Security Administration Punishments or the Criminal Law, depending on the nature of their offences," he said. Beijing police on Monday announced that they had cracked the biggest bike criminal gang in recent years. The police caught 56 suspects and confiscated 172 stolen bicycles. Most of the thieves were from Jianli in Hubei Province.